The humanitarian crisis in Somalia has degenerated into a famine in two regions and could get worse because respite from drought, a major cause of the crisis, which is compounded by insecurity, lack of aid and food price inflation, is unlikely until December or January 2012, the UN warned. "We still do not have all the resources for food, clean water, shelter and health services to save the lives of hundreds of thousands of Somalis in desperate need," Mark Bowden, the UN Humanitarian Coordinator for Somalia, said. Immediate action was required to avoid famine spreading to all eight regions of southern Somalia. “Every day of delay is literally a matter of life or death for children and their families in the famine-affected areas," Bowden told a news conference in Nairobi on 20 July. “This is a time for exceptional actions” in terms of the speed at which aid is delivered, and the conditions under which donors should be willing to give, he added. With malnutrition rates topping 50 percent in some districts, the UN announced that famine had hit Lower Shabelle and southern Bakool regions. A recent assessment, Bowden said, highlighted “the shocking severity of the crisis”, confirming that the rest of Somalia was "close to famine conditions". According to the Integrated Phase Classification's five-point scale, a famine is declared when at least 20 percent of households face extreme food shortages with limited ability to cope, the prevalence of global acute malnutrition exceeds 30 percent and crude death rates exceed two deaths per 10,000 people per day. But naming a food crisis a famine does not legally require action in the way that announcing a genocide would, despite the politicization of the term and the gravity of the label. "Morally speaking, famine is a term that must elicit moral indignation," said Bruno Geddo, a representative of the UN Refugee Agency (UNHCR). “Emotionally, it should push people to do more." Recently, Al Shabab militia, which control parts of Somalia, requested international food assistance. The inability of agencies to work in the region since early 2010 had prevented aid from reaching the very hungry, especially children, contributing to the crisis. "Some 11,000 people have died due to drought in the past 45 days, 9,000 of them in the Bay, Bakool and Lower Shabelle regions, the rest in other regions in south-central Somalia," Abdikadir Hirsi Shekhdon, a member of the government drought committee, said in Mogadishu. “The government and the public are helping the vulnerable people," he added. "For example, the president has distributed 1,000 tents, 1,000 blankets and 1,000 mats to some of the displaced in Mogadishu." But with nearly half of the Somali population - 3.7 million people - in crisis, of whom an estimated 2.8 million people are in the south, the scale of the crisis is huge. The crisis has forced thousands of Somalis to seek refuge in the capital, Mogadishu. “After two years of consecutive drought and the death of all our livestock, I decided to head for Mogadishu in the hope of saving my children,” Farhiya Osman Ahmed, 28, said. 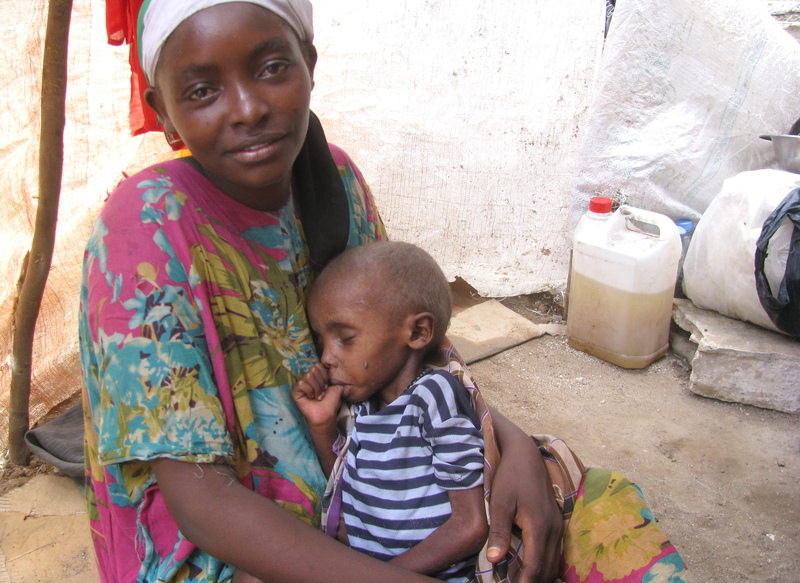 "Upon reaching the city, my children fell ill," she told IRIN. "I don't know what disease they were suffering from. Three of them died and the fourth one is still sick; his condition has worsened in the past two weeks." The humanitarian community has stepped up its response to the crisis, some by setting up cash-for-work or cash relief activities and distributing food. Action Contre la Faim, for example, is airlifting tons of food into Somalia, and UNHCR has added oral rehydration salts, high protein biscuits and water purification tablets to its emergency kits, items not usually included. "So far donors have committed less than US$200 million, leaving an $800 million black hole,” Oxfam GB said in reference to humanitarian funding needs for the Horn of Africa before the famine announcement. Help is still months away, yet warning signs were being reported a year ago by the Famine Early Warning System Network (FEWS NET) and the Food Security and Nutrition Analysis Unit. Fran Equiza, Oxfam's regional director, called for quick global action to avoid a repeat of such crises. "Emergency aid is vital right now, but we also need to ask why this has happened, and how we can stop it ever happening again," she said. "The warning signs have been seen for months, and the world has been slow to act. Much greater long-term investment is needed in food production and basic development to help people cope with poor rains and ensure that this is the last famine in the region."